This a gorgeous chocolate recipe and I hope you will all make it and like it. 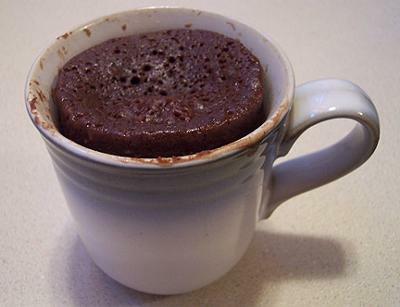 together in a mug, make sure you use self raising flour. 2. Add the wet ingredients (oil, egg, milk) and stir together. 3. Put your mug in the microwave on high for 3 minutes. In the microwave your cake should rise . When finished let the cake cool for a couple of minutes. 4. You can take it out of your mug or just leave it in the mug. You can also serve with ice-cream or any other toppings to finish it off. At first I thought the recipe was a bit too small for the cup. But decided not to double it and see how it turned out. Well I was definitely happy with the cake and more. It reminded me of the old days when I was a kid. As I said to my sister over skype delishimo! 10/10 from me.